It paints a vivid picture of the landscape and ideal park-like environment, filled with wonderful gardens and water features, where Kubla Khan builds his summer palace or pleasure dome. To me our new home has the same qualities and has provided the inspiration behind my current exhibition- Botanicals. Mother Nature has been a defining rationale in my art for many years & I never tire of portraying the endless repertoire she presents on every journey. The stunning gardens of this new abode offer unlimited potential for portrayal in glass. In his later years, Claude Monet found his muse in Givenchy. As a mature artist, I humbly follow in his esteemed footsteps visually & contextually, in my case using glass as the medium to portray changing light, colour & form. Age softens vision, giving a different perspective to everyday objects. My own use of the pate de verre technique acts as a filter that blurs, softens and renders the seemingly everyday with mystical & precious perspectives. Botanicals isn’t about scientific or vegetal correctness but the vision of an artist who is close to and passionate about a particular landscape- Xanadoo. Just like its mythical namesake it is a haven and wonder that transforms through the seasons. 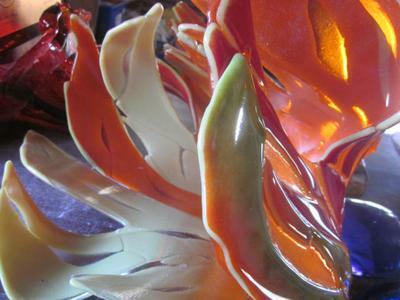 There are other correlations between glass and art and gardens. To build a cohesive and productive body of work art starts with seeds of ideas, just like a garden. If they are sown in fertile ground and nurtured, they grow to full potential. The labour of expression will sometimes produce a bumper crop and at other times a paddock of weeds. The idea needs to be fed with time, patience, trial & error. As with gardening, the returns will not happen overnight, only in the long term. So, look closely through the glass and experience my vision of Xanadoo.